The event has been publicised on this site previously, but the organisers appear to have not done that this year. Plus, as Speed Six points out the organisers of the event actually arrange both the studio visits (unlike the USA, tours of British film studios are very rare) and those where we go onto private property at these large stately homes. This information is kept secret from the attendees and so we don’t know in advance where we are going, until we actually get there. I believe there were two Treasure Hunt event websites at one point, but I think it would be a good idea if there was a permanent one, or perhaps a section of an existing Avengers sire devoted to it. Any takers? OMG Speed six that was fantastic video even if not in the best shape. The guys filming were so cute. Who made the video? What a great tour! Agree we need some sort of announcement about this wonderful yearly event. Pretty much everyone that attended last time has registered for this year (and in record time too) meaning that we're at full capacity and so advertising the event was rendered pointless. I really should have mentioned that you are also responsible for finding a huge amount of Avengers and New Avengers filming locations. A website devoted to the event is a great idea. You are aware that I have quite a bit of paperwork and photographs from the early Treasure Hunts that could be used? Oh wow I wish you could have more than one treasure hunt if you are at full capacity! That is such a fantastic adventure! When and how does one sign up for the event for next year? Contact Geoff? is it mariocki? Would be so great to see your pics and paperwork MikeR! Was that your vid on youtube? It was very entertaining whoever it was! That sounds like a good idea. I've been wanting to go on this for years but never manage to find out about it until it is too late. As Mariarcki is involved in the organization of the event, I take it that he'll read the thread and come up with some contact details for the event in 2014. Meanwhile, I'll see what I have that can be scanned in. No problem Mike, rest assured I will be bothering you when the time comes Organising this years' event has taken up a lot of time so the website has had to take a back seat but hopefully you'll think it was worth it come the day. Sorry about this years' event but we were rather taken by surprise with the phenomenal demand for places. We keep a mailing list of attendees and I think I'm right in saying that most of the places had gone inside a week of the initial e-mail being sent out. We can only offer a limited number of places due to the logistics of transporting people to the locations so once we're at capacity, that's it I'm afraid. I'll make sure to mention next years event on here as soon as the details are finalised. 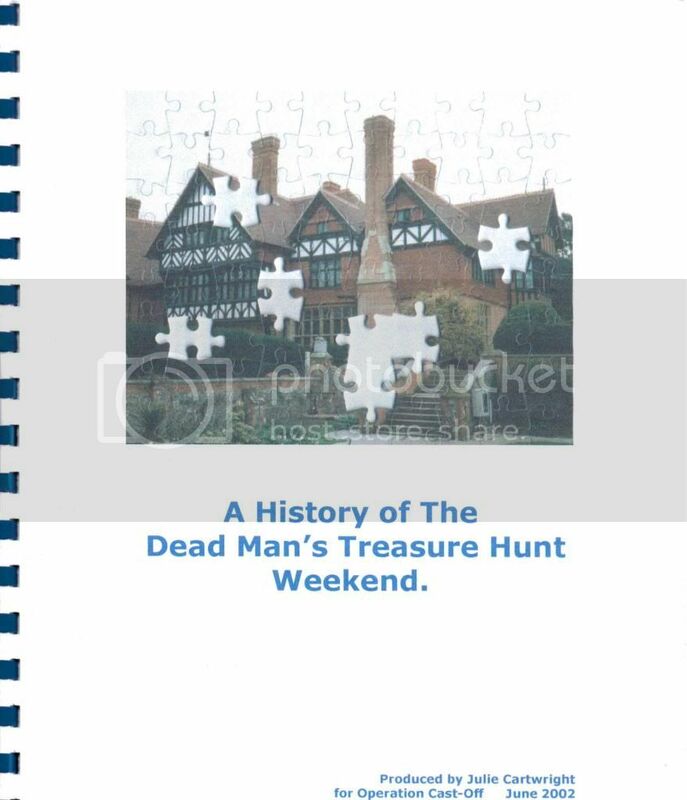 Okay then when I started looking for paperwork regarding the Treasure Hunt event I could hardly find anything, but what I did find was (from the top) the booklet outlining the history of the event up to 2002. The theme for that year was the episode Game, which featured location work at The Grims Dyke Hotel as seen on the cover. A photograph taken on my first visit to the Borehamwood/Elstree area of the triangles of grass outside Shenley Hall. At the time I was just happy to have found somewhere I recognised and did not realise that the large building in the grounds was Shenley Hall, the location of Benstead’s manor from the episode Dead Man’s Treasure. The entrance behind the car is no longer used and a new entrance was made years ago round the bend on Rectory Lane. 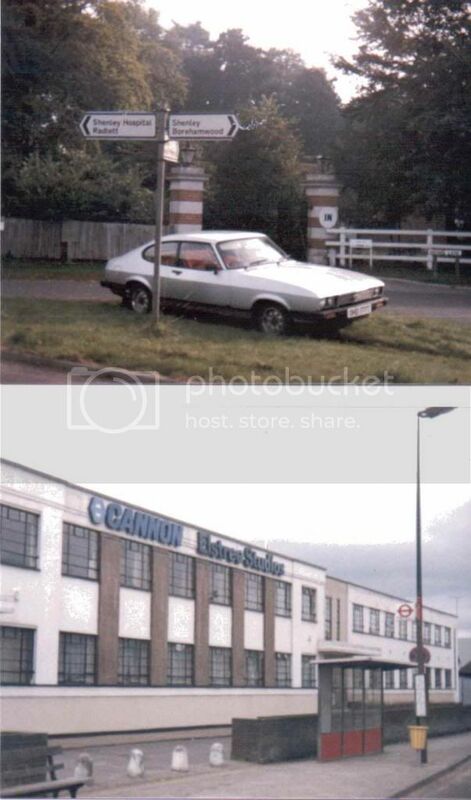 The next photograph is the frontage of Elstree Studios, where The Avengers was filmed, when the Cannon Group owned them before selling them to Bent Walker who sold part of the premises off to Tesco who promptly demolished this building along with soundstage 1 to 6 and built a supermarket. Underneath that there is the fridge magnet awarded to all attendees of the 2010 event when From Venus with Love was the theme. Then there is a beer mat from The Salisbury Crest public house at Essendon, which provided the exterior for the country hotel in the episode Invasion of the Earthmen. However, this was closed down some time ago and converted into a house. Finally, the name badge from last year’s event. How is the treasure hunt organised? is it in a big group or does everyone drive to different sites individually? Sorry, try with this one again. The location visits take place on either one or two coaches, or when we went to central London, the organisers hired an ex-London Transport double decker Routemaster for the occasion. That's fantastic. I don't quite follow the 2010 Pic you have here almost looks like an eye chart from an opthalmologist office! beginning with the letter D. Is that suppose to be some code to figure out? Got it! Dead man's Treasure Hunt from venus with love! Brilliant! What a marvelous occasion. Thank you for sharing all this Mike! Some lovely images. I'm not too keen on the pub being turned into a house though! The opthalmologist's chart should feature trilbies, etc i.e. hats. Each event has a theme, which is usually an episode. The theme for that year was From Venus with Love and as you say it looks like an eye chart, which is exactly what it is, based on Steed's visit to Dr Primble's eye surgery. Though as Frankymole says it should be made up of various different hats. thank you Mike! When did this event start? Do you go every year? 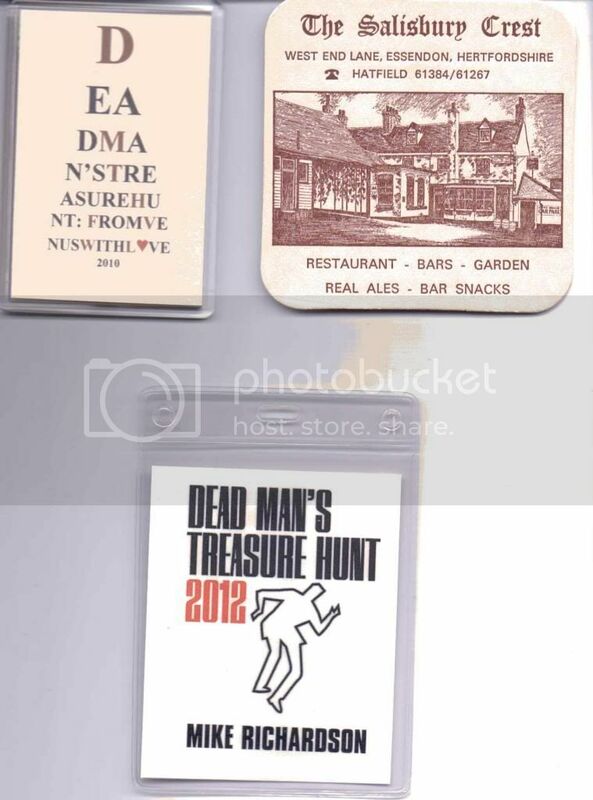 The first Dead Man's Treasure Hunt event was held in June 1987 and I've missed about three of them. So that was your video! That is so cool you make it a yearly venture. Please let us know how this year's event goes. No doubt you are busy getting ready for this years event but I wonder if I could give you my email --if the site is safe which I think it is. What time of year do you send out invitations? How far in advance of July in general? Thank you so much and hope one day i will be able to attend this wonderful event!